Do you have plans of creating and eventually running your own website? If so, you may be familiar with the dilemma of trying to find a place to house it. Those who are new to this whole thing may be in for some confusion, but it does not have to be too confusing. Web hosting is far from a simple topic and looking for the right options for your specific needs can be quite difficult at times. Know that there are multiple factors to take into consideration and each one is going to be a massive influence on whatever decision you may come up with. Even as you go on with the process, you are still likely to have numerous questions that need answering. In this article, we aim to help guide you through your present predicament. First, we will explain what web hosting is all about. From there, the main hosting types will be presented and each one will be discussed at great length. What you can expect here is specific information for each type, the pros to choosing them, the associated cons, and then there will be a short discussion as to the type of people who are best suited for a particular web hosting option. Without further ado, let us start things off with . . .
What Exactly is Web Hosting All About? As interesting as it is to talk about the different options immediately, we must first clear up what web hosting even means. To put things simply, it has everything to do with the websites that you view on any browser. That is surely a familiar scenario for you, but it is only made possible due to the fact that said browser had already downloaded a number of files, which are all filled with code. Its markup is then converted into the visuals that ultimately comprise of the website that shows up on screen. Sounds pretty simple, right? To gain an even deeper understanding, we need to talk about the files that are downloaded by the browser. These areas accessible as any other file that may be stored on your own computer. What makes them different at the end of the day is that unlike your own files, these are not stored in any hard drive; you can find these in a separate computer, which is called a server. More powerful than any laptop in your possession, servers are there to manage a multitude of clients simultaneously. Yet for all of the differences in power and capacity, servers also have things in common with your own computer. Among these would be the CPU, operating system (typically Linux based), memory, and various other important components. The owner of the server will then rent it to those who own and operate websites. Part of the services they provide will include server support and management, data backups, scanning for malware, and so much more. This is what more or less comprises of web hosting and those who do all of this are known as hosting providers. Now that we are all clear about the process and its details, the time has come for us to take a closer look at each of the hosting options that are available to you. The first type we will be looking at is shared hosting. When talking about this, you can expect it to be just what it sounds like: you have your own shared hosting account and the website you own is located in the exact same server as various other sites. You may be wondering just how many websites are already in that server; that would depend on two specific things: the hosting provider and the general setup. It can be good to know that it is not uncommon for sites to share the same server with hundreds or even thousands of others at the same time. When it comes to implementation, there are generally two ways to accomplish this: first, there is name-based and then there is IP-based. There are also some control panels that will allow for a mixture of both, depending on the server. For IP-based, which can also be referred to as dedicated IP hosting, each of the virtual hosts will have their own IP address. There are multiple physical network interfaces configured in the web server. The software makes use of clients’ IP addresses to determine the website it will shower the user. Due to the IPv4 address exhaustion issue, IP addresses are becoming quite scarce, making the use of a site’s own SSL certificate over shared certificates as a primary justification. Now we turn our attention to name-based virtual hosting, which is alternatively referred to as shared IP hosting. Here the virtual hosts are serving multiple hostnames all within a single machine; what’s more is that it also operates under one IP address. Such a thing is made possible when web browsers make a request for resources from web servers that utilizes HTTP/1.1, which includes the hostname. From there, the server utilizes this information to find out which website is to be shown to the user. When it comes to this particular option, you will be pleased to know that your biggest advantage is the server cost being shared between yourself and various others. Should your hosting provider be capable of placing up to a thousand clients in a single server, then expect that the overall operating cost will be evenly spread among the different parties involved. If you haven’t already, think of how affordable this option would be. For some, it can be as cheap as paying $2 per month, with an average cost that is in the range of $5 to $10 per month. Clearly, this is an ideal option for those people with very limited funds or for those who are just starting out. Another benefit to talk about is the fact that shared hosting accounts tend to be taken care of entirely when it comes to the setup. On your part, there isn’t much left to configure, which means there is now more time for you to devote to the building of your website. Having said all of that, now we can move on to the cons that you will also inevitably face. Let us get the main one out of the way: sharing a server with multiple parties is hardly an ideal situation for anybody. Resources are going to be limited and things are going to slow down considerably. When you look into this main problem, you are likely to find a multitude of smaller issues related to it as well. For example, one website may end up hogging up a great amount of the server’s processing power because of an increase in traffic or even through faulty coding. Such an issue would leave the rest with far less and as such, everybody will compete for what is left. Downtime will be inevitable for many websites or, at the very least, there will be a reduction in terms of loading speed. There is even a phenomenon for this; it is known as “bad neighbor effect,” which counts as among the primary reasons why shared hosting can also be the most problematic web hosting type out there. Most hosts are keen to avoid this scenario, but it remains an ongoing risk. Hostinger: This is a web hosting provider that is employee-owned, as well as an internet domain registrar. Now with over 29 million worldwide users in 178 countries, it makes good use of cloud web hosting tech and provides hosting through the use of PHP, FTP, and MySQL. Hostinger was originally established back in the year 2004 in Kaunas, Lithuania. Back then, it was referred to by its original name of Hosting Media. The name change took place in 2011 after the company first reached the milestone of having one million users. Their subsidiary 000webhost was established in 2007, which soon followed a rapid international expansion. By 2014, the company’s services became localized in nearly 40 countries. HostPapa: This web company is privately owned and is based in Canada. Among its services provided for includes shared hosting, virtual private server hosting, and reseller hosting. The list of countries that it operates in include the United States, the United Kingdom, Australia, New Zealand, Germany, Singapore, Mexico, India, Hong Kong, France, Belgium, Ireland, and Spain. HostPapa entered the hosted applications and dedicated market back in 2002 and started servicing clients by 2005. Officially, it wasn’t until 2006 when it was officially founded by Jamie Opalchuk in Canada. Its present company logo, which includes the ‘Papa’ character, started out from a logo design contest called, ‘Who’s Your Papa?’ Among its awards received since its founding includes the Uptime Awards, which HostPapa received in 2015 from NCM Online. InMotion Hosting: When it comes to highly rated, you should look no further than InMotion Hosting. This company boasts an incredibly stellar track record and has the recognition of several publications around the world as a top-level company. It managed to get an A-plus rating from none other than the Better Business Bureau, which is a consumer protection organization that takes it upon itself to monitor and evaluate businesses located in North America regarding their integrity and their overall performance. This company is based in Los Angeles, California, where one of two data centers can be found. Both website and domain services are provided by InMotion Hosting. Among its most notable features include their incredibly fast services, which are also quite affordable. Their after-sales support is also known to be incredibly reliable. Virtual Private Server, often shortened to just VPS, is described as being one of the most well-balanced of the different web hosting types. Like shared hosting, this is still something of a shared environment, although it must be noted that its set up is quite different. The websites that are on VPS are all contained in a single physical server, which houses a myriad of separate virtual machines. VPS is, therefore, something of a middle ground between clients having their own dedicated server and the aforementioned shared hosting. 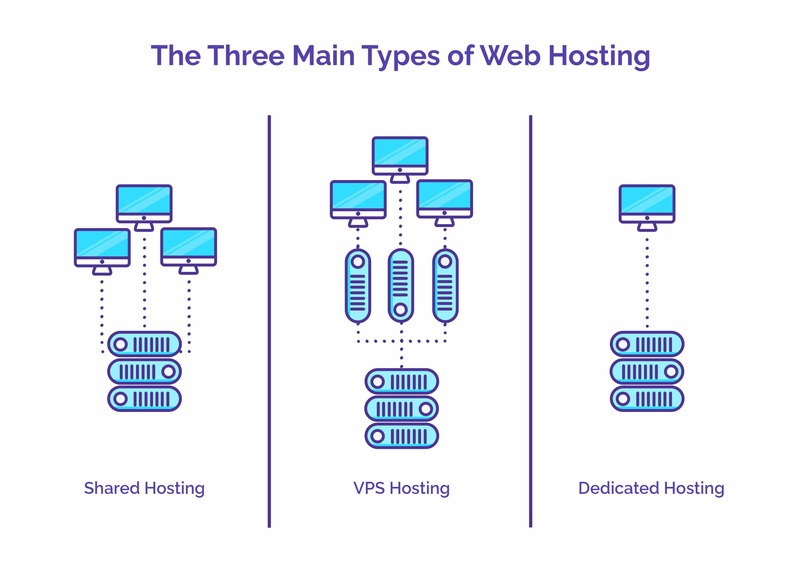 As we look into its pros, a notable thing to say about VPS is the fact that it is considerably more reliable and much more stable when compared to shared hosting. There is also a limitation to the number of websites contained in each server, with the numbers ranging from ten to twenty. This tends to lower the demand on servers in themselves. The real improvement to gush about is the fact that this allows a balanced split of resources between the various websites with no one allowed to exceed the others. Once you have reached the limit of the assignment, you can expect your site to go down, but all the rest will continue to remain stable. This is primarily done through virtual machines that can make separations within the server. Having this simple addition is enough to mitigate the majority of whatever ‘bad neighbor effect’ that may go on otherwise. Yet another big benefit that deserves to be pointed out is the greater flexibility provided, which can lead to greater customization of the environment. This is not possible in shared hosting since doing so will lead to changes in everybody else’s setup too. With accounts being contained inside virtual machines, changes can be freely made without having to affect everyone else in the server. Last but certainly not least is the scalability of VPS. Since you happen to be running your own virtual machine that takes a certain percentage of the server’s available resources, increasing whatever is available to you should be no problem at all. Many would consider this a great comfort to have, particularly those business owners who wish to see their websites grow even further and flourish. With that out of the way, we can proceed to the cons of VPS, although many would be happy to learn that there aren’t much to begin with. The most notable con would be the simple fact that this will cost a lot more than lower-tier solutions. Those who are on a tight budget need to recognize this early on and make whatever adjustments they need to their plans accordingly. If you want a specific figure, then take note that average VPS tend to cost as much as $50 per month. There are even times when it scales all the way towards the $200 range. However, there are also scenarios where $20 per month can be attainable. This should not be much of a problem for businesses with an established customer base anyway. As you begin to climb through the ranks and reach a top-tier level of this particular web hosting, you are likely making enough to be able to cover these costs easily. Siteground: This is a web hosting company that was founded by a group of university friends back in 2004. A recent report shows that it is presently servicing 1,700,000 domains and beyond throughout the world. The company currently employs well over 400 people and has data centers in countries like the United States, the United Kingdom, the Netherlands, and Singapore. Concerning its involvement in open-source communities, Siteground collaborates with WordPress, Joomla, and Magento, among others. Since 2013, it has also served as a WordCamp Europe sponsor. Among its partners include companies like SingleHop, CloudFlare, SoftLayer, OpenSRS, GlobalSign, cPanel, Spam Experts, Softaculous, and Open Classifieds. This company is also an outspoken opponent of the SOPA and PIPA legislation. Bluehost: This is another web hosting company founded in 2003. It is owned by Endurance International Group and is considered one of the twenty biggest web hosts. Collectively hosting over two million domains, its sister companies include FastDomain, HostMonster, and iPage. Over 700 people are presently employed in its Utah facility. The company was one of many that were studied in an analysis of web hosting services in online learning programs. Its founder, Matt Heaton, first conceived the concept back in 1996. In the year 2009, it introduced a feature known as CPU throttling, which refers to the reduction of a user’s CPU usage whenever said user ‘pulls too much’ of the server’s resources at a single time. DreamHost: This provider is based in Los Angeles and also serves as a domain name registrar. It is a private company owned by New Dream Network, LLC. Founded in 1996 by undergraduate students Dallas Bethune, Michael Rodriguez, Josh Jones, and Sage Weil, the company eventually started hosting the websites of their clients by the following year. In the present day, it has nearly 400,000 customers as well as 200 employees under its belt. The servers utilized for their services operate on Ubuntu and are capable of offering computing services and cloud storage not just for entrepreneurs, but for developers as well. If there is one thing to note about DreamHost, it is the fact that they don’t offer any call-in phone support. Customers also need to pay extra if they want to request any callbacks from the support staff. HostGator: This powerful option is not only quite affordable but is good for both enterprises and small businesses that are in need of a wide range of services. HostGator was founded back in 2002, with its headquarters settled in Houston, Texas. They also have offices in Canada, Brazil, Mexico, and Russia. Since then, it has become an incredibly well-recognized company, having won multiple awards and successfully managed around eight million domains. Examples of said domains include top companies like AT&T, Dell, and Cisco. Its servers are known to be quite flexible and configurable as well; they can be either managed or just semi-managed solutions, which can be quite ideal for those high-traffic websites and for larger businesses. So if you want instant scalability, advanced management, and high-level security, you don’t need to search any further than this. This is the one meant for those in the big leagues. As suggested by the name, getting involved in dedicated hosting means having a server all to yourself. You can probably think of a list of benefits in regard to this particular situation, but know that it will also come with several downsides. Let us kick things off with all the pros of having this at your disposal. Among the main advantages is the simple fact that it can negate all of the bad neighbor issues of the previous web hosting types. You don’t have neighbors when it comes to dedicated hosting; all of what the server has to offer are yours and yours alone to enjoy. There won’t be any other website that will steal any of your resources. No one else will be around to pose a potential security risk or create any other type of issue. By itself, this benefit already proves to be a worthy distinction from the previous types discussed previously. Besides that, you are also given the greatest amount of customizing freedom since the computer is all yours. Just think of the possibilities: choosing your own OS, the type and amount of memory, any hardware element is yours to make decisions on. Moving on to the cons that dedicated hosting also comes with, the biggest thing that you can worry about would be the vast amounts of money that you will need in order to use this. You can expect prices to start off at an already steep $60 per month, which will soar even beyond $350. As uncomfortable as that may sound to many of you, the fact that you are able to reach the point where your business requires a dedicated server means money won’t be much of a problem anyway. In addition to all of that, you are required to have even greater knowledge of both server technology and computers in general. After all, you still have to do quite a lot by yourself, so this is perfectly understandable. An extreme situation can potentially see you acquiring an entirely unmanaged service, which could end with you installing the OS all by yourself. From there, you must deal with all of the required tools to properly run your web server, provide greater security scanning, the removal of potential malware, and so much more. A solution to this arrives in the form of hiring your own server admin, but even that will come with its own additional expenses that you may not want to deal with. Having a dedicated server is also akin to putting all of your eggs in a single basket. Should the hardware fail, then your website is out. When it comes to the other arrangements, various other modules are capable of taking over in the event of failure or it can just be replaced. With dedicated servers, all of that could take a much longer time, especially if you are the only one monitoring things. iPage: Owned by Endurance International Group, iPage is yet another domain registration and hosting company you can look into for your needs. You can rest assured that a wide range of solutions is available for any online business, and for webmasters to create the best possible websites. The company is among those who offer incredibly cheap and low-cost hosting packages, many of which are quite suitable for smaller websites. It was first founded way back in 1998 by Thomas Gorny. Although a full-on web service provider at first, it was then relaunched for hosting services in 2009. AccuWebhosting: This is a New Jersey-based company that was first founded back in 2003. Since then, it has offered exquisite hosting services to various users numbering in the thousands. You can expect highly advanced technology together with quick responses from their support team, dedicated surveillance round-the-clock and an uptime guarantee of 99%. Another notable thing about this is how competitively priced it is, with offerings that are priced starting $75 a month. Their clients’ plans are fully customizable, based on whatever specific requirements they may have. Lastly, the company also offers free mitigation support, but only for its first three hours. Any initial configuration and setup are costless. Arvixe: This company is based in San Obispo, California and has been the recipient of multiple awards. It was originally established back in 2003 and has since hosted practically thousands of websites that range from personal to those of small businesses, all on a global level. Leading publications have recognized Arvixe as being among the most rapidly growing hosting company in the entire world. The company anchors its services on strong combinations of unsurpassed reliability, affordability, and overall quality. Type II certified data centers operate not only out of New Jersey, but also Chicago and Dallas. Among its services include hosting for the web, CMS, blogs, eCommerce, forums, community websites, and social network. As far as price range goes, customers can avail of what they have to offer for as little as $131.70 to as much as $230.50 per month. JustHost: This company was founded back in the year 2008 and now has offices in various countries like the United States, Australia, and the United Kingdom. Its data center is based in Chicago. Besides dedicated hosting, JustHost also has budget-friendly offers for VPS. Other services include domain registration, custom tailored support, unlimited domains, a cPanel control interface, and round the clock network monitoring. You can expect custom-built dedicated servers that have industrial grade components like Intel Xeon processors. Some of the best software money can buy are utilized by JustHost to ensure its ongoing peak performance and power. Liquid Web: This is yet another highly-rated company that has been in operations for the past two decades. Customers in 130 different countries have all been satisfactorily managed by Liquid Web, and more than half a million websites have been managed through the five data centers it has around the world. The company’s hosting services are known to cater to businesses, corporations, agencies, and in particular, those that have mission-critical stores, sites, and applications. Although its primary focus is on dedicated hosting, you can also avail of shared hosting and VPS, all of which come in top notch packages. For dedicated, you can expect guarantees such as 30-minute initial response time, 100% network uptime, and a 30-minute replacement for the hardware. They say that knowing is already half the battle, but even when you are already armed with all the right knowledge, what lies ahead when it comes to selecting the best hosting package can still be very complicated. Everything you have read about shared hosting, VPS, and dedicated hosting must be carefully considered. Let us assume that you are truly new to everything and that you are starting from the ground up. You won’t be in the same position as those for whom it makes sense to choose VPS or dedicated hosting, so you would naturally pick shared hosting as the best choice. This makes the most sense since your circumstances will be a far cry from those who have been running their own websites for years. Regardless of what your website is all about, shared hosting will suit you well for some time, but you would eventually want to get a move on. Eventually, you will consider jumping ship to a hosting option that will reflect where you are as a website owner. Staying in shared hosting may even be a logical step, but you may decide to go from a low setup server to a much higher end one with an obviously greater quality. Or you may be in a position to ditch shared hosting entirely and move on to something like VPS. The key in choosing would be the explore and make discoveries regarding what your website requires. From there, determine if your current server is capable of fulfilling those needs or not. If it cannot, then your way forward is clear. After taking things into careful consideration and making a firm decision, your next step would be to look into the right companies to approach. There are lists online that can allow you to look up the top rate hosts that will provide you with the right options to work with. Just like with your decision on choosing the right web hosting type, take a good look at each host and see what they have to offer. Evaluate and compare things like their RAM, CDN usage, disk space, bandwidth, and various other quantifiable resources. Besides that, take a look at what unique features they offer. You never know what you will eventually need down the line, so choose carefully. It would be wise to pick out at least two or three companies. This will make the act of coming to a final decision much easier. You can even have a short discussion with each of their support teams, so you can gauge for yourself how helpful they will be in the event of an emergency. Expert advice to help you get most of your servers. Sign up to get the latest news and tips delivered straight to your inbox. OpenVZ vs KVM VPS – What is the difference?